Das einzigste was man lobenswert erwähnen kann ist das Restaurant ich habe dort zu Abend gegessen und es war wirklich sehr lecker! 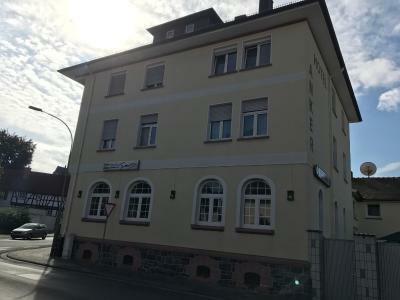 Nun ja, das Haus hat Historie und das ital. Restaurant macht einen soliden Eindruck. Und Wunder erwartet man für den Preis ja nicht, immerhin gab es kurzfristig noch ein Zimmer. Fantastiskt god och prisvärd mat i resturangen. Frukosten var ok.
Frühstück okay, aber etwas Käse wär auch nicht schlecht gewesen. Das Preis- Leistungsverhältnis ist akzeptabel, die Lage ist wegen der relativen Innenstadtnähe akzeptabel. Ansonsten fallen mir keine positiven Punkte mehr ein. Nah zur Autobahn. Hund willkommen. Gutes Restaurant, sehr gut besucht. 생각보다 침대도 편안했고 허름해 보였는데 깨끗하고 온수도 잘 나오고 공간도 넓었어요. 그리고 조식도 미리 세팅해주어서 편하게 아침 식사할 수 있었어요. Located in Großenlinden, Hotel Anker features a garden. Featuring luggage storage space, this property also provides guests with a playground. Guests can have a drink at the bar. At the guesthouse, each room is equipped with a closet. Free WiFi is accessible to all guests, while some rooms also offer a patio. A continental breakfast is available every morning at Hotel Anker. Bad Homburg vor der Höhe is 31 miles from the accommodation, while Marburg an der Lahn is 23 miles away. 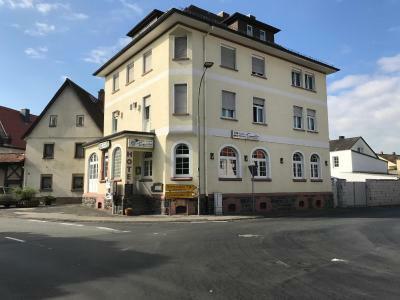 The nearest airport is Frankfurt Airport, 42 miles from the property. This property also has one of the top-rated locations in Großenlinden! Guests are happier about it compared to other properties in the area. This property is also rated for the best value in Großenlinden! Guests are getting more for their money when compared to other properties in this city. 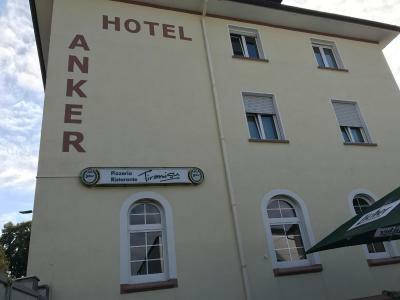 When would you like to stay at Hotel Anker? This double room has a seating area, executive lounge access and sofa. This double room features a cable TV, executive lounge access and sofa. House Rules Hotel Anker takes special requests – add in the next step! Any additional older children or adults are charged EUR 2228 per night for extra beds. Hotel Anker accepts these cards and reserves the right to temporarily hold an amount prior to arrival. Hi, hotel has no breakfast, because restaurant opens 11:30 and it is all closed in a morning, even no reception or anyone else. If you need something forget it. Room we had had small old TV. Staff barelly speaks English. Location is very noisy as it is on main road. Tried to paid for hotel with card, but machine didnt worked, so paid in cash 190EUR, but got invoice next day only for 180EUR. A lot of mold and black fungus in the shower!! Was very hard to regulate the water temperature because of old water-supply system. Absolutely awful sound-isolation, rather no isolation at all. And all of it with a price almost 60 € for 1 Night!